When you’ve been around as long as the Delta Queen, a whole lot of people develop a whole lot of affection for you. This may explain why, even 6 years after being shut out of overnight cruising, some people are still trying to get her back on the rivers. It may also explain why so many songs have been written about the Delta Queen. First, a little background. The Delta Queen was built in 1926 for $875,000 (over $11 million in 2012 dollars). It took its maiden voyage the next year. 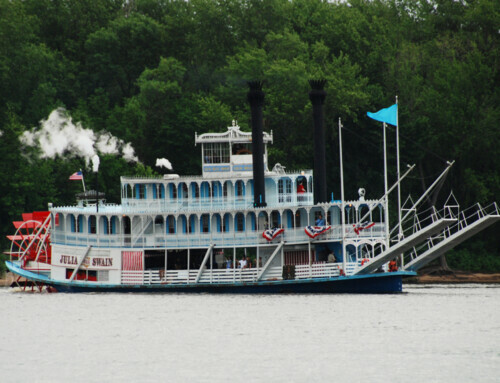 During its life, it ran overnight cruises from Sacramento to San Francisco, served in the Navy during World War II, entertained representatives of the 51 founding members of the United Nations in 1945, and entertained passengers on the Mississippi and Ohio Rivers from 1948 to 2008. In 1989, it was declared a National Historic Landmark. If the Delta Queen was a cat, it would be down to its last three lives. In the 1930s, river cruising waned in popularity as people were seduced by the thrills of driving their own automobile. In 1946 the Queen was returned to civilian life after serving in World War II and nearly ended up on the scrap heap. In 1954 a thrown rod nearly sank the company, and, after being rescued by salvaged parts from its less fortunate twin, the Delta King, the company was rescued from bankruptcy just four years later by a white knight, Richard Simonton. Two times, in 1970 and again in 2008, the Queen has faced an existential threat because of the Safety of Life at Sea Law. The law, passed in 1966, was aimed at improving the safety of ocean-going vessels; it made it illegal for passenger boats with wooden superstructures to carry more than 50 overnight passengers. After the bill passed and it was clear that its rules would also apply to vessels on inland waters, Congress granted exemptions to Delta Queen that were to expire on November 2, 1970. As the deadline approached, a single congressman, Edward Garmatz, chair of the House Merchant Marine and Fisheries Committee refused to grant any more exemptions, even in the face of a publicity blitz and charm campaign. The Queen’s reign seemed over, so lobbying turned to eulogizing. Johnny Cash paid tribute—bid the boat farewell, truthfully—with a song on his show on October 14 called Salute to the Delta Queen. On October 21, the Delta Queen pushed off from St. Paul and headed downriver, a trip that almost everyone believed would be its final overnight cruise. But it wasn’t. Congress found a way to pass a bill with an exemption that bypassed Garmatz’s committee and the Queen was back on the water in 1971, welcomed by big crowds happy to see her back on the rivers. Congress routinely granted the Delta Queen exemptions from the law from that point forward (usually in five year increments), but in 2008 two key members of Congress blocked attempts to do it again. This time there was no last-minute miracle. The Delta Queen stopped operating as an excursion boat and became a floating hotel in Chattanooga, Tennessee in 2009. Like I said, with a history that long and tortured, it shouldn’t be a surprise that the Delta Queen has made its way into so many songs. Most of the songs simply pay tribute to her in one way or another (Country Gentlemen, Danny O’Keefe, Larry Goodwin, Lonesome Standard Time, PS, Bawn in the Mash, Tirk Wilder, Bobby Joe Swilley, Johnny Cash), sometimes channeling more than just a little lounge lizard in the process. Other songwriters, though, see the Delta Queen in more symbolic terms, either as a chance to get away from trouble (Andy Owens) or as a white knight in its own right saving a vanquished foe in a mythical steamboat race (Bobby Goldsboro). A couple of songs are about epic gambling contests (Dan Rivers; Mason Porter; Under the Hood), although the boat never hosted much gambling beyond a few slot machines in the 1930s (at least officially). Some of the songs simply extol the easy living that is a cruise on the Delta Queen (Leftover Salmon). There are some fine songs in this group, but there are three in particular I want to highlight. First is this sweet and sentimental tune from John Hartford that evokes the romance and timelessness of traveling on the river with the one you love. The Howlin’ Brothers go in a different direction than Hartford with a rousing tune about partying and enjoying life on the Delta Queen. Turn up the volume for this song, because you’re gonna want to get out of your seat and dance. For something completely different, check out this song from 1970 that was written at one of those times when the boat’s future was in doubt. Save the Delta Queen was recorded by a band you’ve probably never heard of, Carp, although you will almost certainly recognize the lead singer, Gary Busey, who went on to greater fame as an actor.